What sets Azusa StreetRiders apart from every other Christian motorcycle ministry or club in the world? We are bikers of — The Name! And that name is — JESUS! Across the globe, nearly 700 Christian motorcycle ministries and clubs have been identified, but Azusa StreetRiders stands alone in professing and proclaiming the name of JESUS as the one name that fulfills all the qualifications of Matthew 28:19, the one name in which all believers are to be baptized (see Acts 2:38, Acts 8:16, Acts 10:48, Acts 19:5, etc. ), and therefore the only name by which we must be saved — even as the scripture says: “Salvation is found in no one else, for there is no other name under heaven given to mankind by which we must be saved” (Acts 4:12 New International Version). Please join our site, and we invite you to look around and get a feel for our ministry. Feel free to share any comments or questions that might be on your mind through our online posting area. We hope you will step out of your comfort zone and take an amazing journey toward getting where you need to be in your personal and spiritual growth. We hope you have a wonderful, anointed experience with us as we fellowship together. If you have a prayer request or are in need of prayer, we invite you to submit that need to us. Your prayer request opens the door, and God is waiting patiently on the other side of that door, at all times, in all situations, to join with you. Please help support your Local Chapter of the Azusa StreetRiders. All donations go to help in various ways including the purchase of motorcycles for overseas missionaries and many other outreach programs. Do you know of anyone who rides? Please invite them to come and join us for a ride! Everyone is welcome, and all makes and models of motorcycles are welcome also. Deadline for registration: March 31st with guaranteed rooms set-aside. After that you will receive the volume rate, however based strictly on availably. Must mention Azusa StreetRiders group rate. Limited continental breakfast is served in our private dining room. Anyone not staying at the Highland Manor can pay $4.50 and access the breakfast bar. There are several restaurants in the area also. Deadline for registration June 30th with guaranteed rooms set-aside. After that you will receive the volume rate, however based strictly on availably. Must mention Azusa StreetRiders group rate. Note: Your type of camping determines the cost. Contact KOA for pricing details. 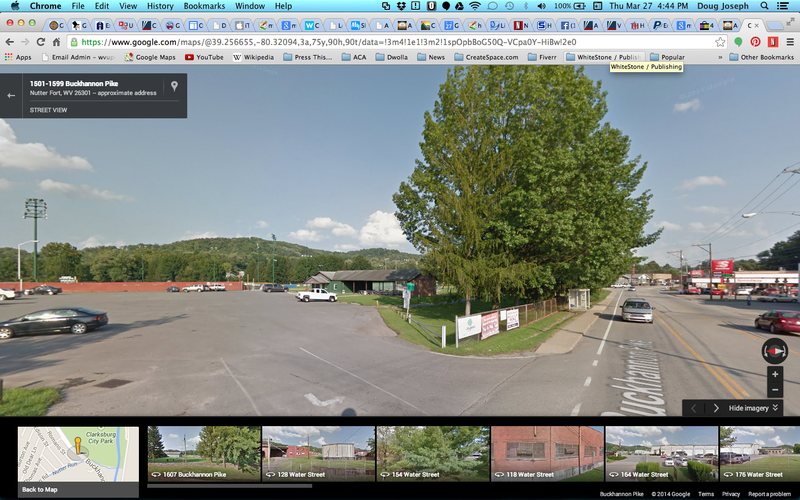 Note: There are several hotels in the Maryville/Alcoa area. We chose to host at these hotels in Townsend so we would not need to fight traffic coming and going on our rides. We will be departing from the Highland Manor both Thursday and Friday mornings at a specified time. Ride time to the church is approximately a half hour ride. Say hello to our new site! Welcome to our newly remodeled azusastreetriders.com website. Please help us out by taking a moment to let us know about anything you see missing, or anything you see that needs corrected. God bless you! This is a reminder that we as members of ASR can contribute to the Expense Reimbursement Fund. Thank you in advance for your contributions as we continue to grow this ministry. 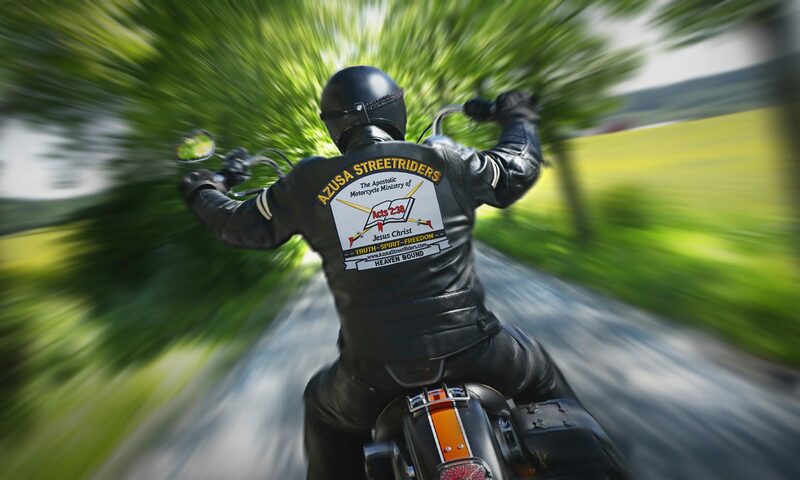 As most everyone knows, since its inception in 1999, not a single penny has been taken from the Azusa StreetRiders account to pay for any expenses incurred by any of our members. This means that all travel expenses (gas, tolls, flights, food, hotels, etc.) have been the sole responsibility of the member. All funds received, without exception, have gone to purchase motorcycles for Oneness Apostolic missionaries or direct organizational expenses (postal charges, display booth costs, etc.) Additionally, even for the products we sell (t-shirts, flags, motorcycle paraphernalia, etc. ), all profits are re-invested into ASR to help promote/recruit so that we can be more effective in our outreach efforts. Don’t you wish this was the case with all “charitable” organizations? No “sleazy” relationships lining the pockets of friends! Because of this mandate (included in our bylaws), to serve in any capacity with Azusa StreetRiders is both an honor and a privilege that sometimes carries a tremendous personal financial burden. All parties interested in serving on the board of directors are apprised of the fact that no reimbursements are permitted and for this reason, highly qualified individuals are sometimes not able to serve. This is unfortunate as we want the best of the best to be in leadership positions throughout Azusa StreetRiders. ASR Travel & Expense Fund (info for ASR members) (PDF format, 86 KB). Info: Please donate to the ASR Travel & Expense Fund, a separate account to help our national board members to fulfill their many duties. This fund is independent of all other ASR accounts and disbursements require pre-approval from the Travel Advisory Board. Click for more details about this fund. ASR Travel & Expense Reimbursement Policy (info for ASR national board) (PDF format, 81 KB). Info: This document establishes policies and procedures for the reimbursement of travel and expenses incurred during the conduct of outreach and other approved travel for a Board Member of the Azusa StreetRiders. Click for full details. ASR Travel & Expense Report Form (for ASR national board to submit) (XLXS format, 19 KB). This spreadsheet form provides an easy way for a Board Member of the Azusa StreetRiders to document the needed details of a request for reimbursement. Due to a flood of fake registrations recently, the Azusa StreetRiders website is currently in “invitation only” mode. This means that real people trying to register on the site won’t be able to unless they first get an invite from you or another current site user. The following report is from Michael Theodore Sr, who serves as the ASR District Coordinator for Ohio, seen at far left in the above photo. “July 11-13, 2014 was the 5th Annual Biker Sunday in memory of Michael Theodore Jr. This year we made our event for outreach and we added a pig roast to Biker Sunday. Our count of ASR members present was just shy of 30. We had members ride into northeast Ohio for the event from as far away as Nebraska, Missouri, Tennessee, West Virginia, and from all over Ohio. “We started off the weekend with a meet-and-greet on Friday evening. This is a great way for members to get to know everyone and just relax from their day’s ride. “Saturday we had kickstands up at 10 AM. 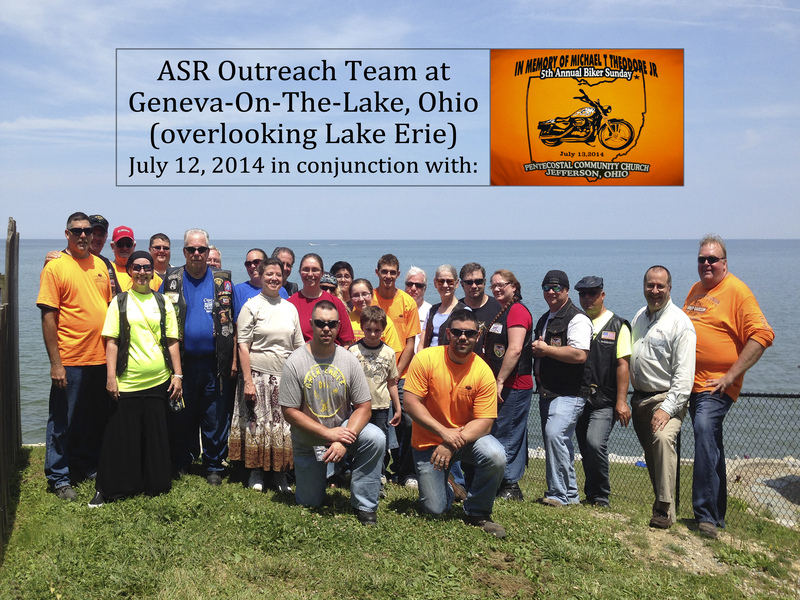 This was a day of riding up to Geneva-On-The-Lake, a biker town overlooking Lake Erie. Saturday was all about outreach. Once there we picked a spot to have Bro. Jim Curley (ASR National Chaplain) to give us a few words from the Lord, and then give us some great pointers on outreach. He then prayed over the 300+ dinner tickets that we were giving out to people to get them to come to our Biker Sunday/Pig Roast. We divided into teams of 2 to 4, and just took over the strip up there on the Lake in Geneva. It was totally amazing to see each ASR person working the street. To God be the glory. After spending a few hours in the hot sun passing out dinner tickets and witnessing to people, it was time to mount up and ride to someone else’s benefit dinner. That’s right, we all rode to a benefit dinner for a friend of ours who has a brain tumor. As we all pulled into that church parking lot, everyone started to take notice. They were all wondering what was going on. We stayed for the dinner, and wow, did ASR evermore make a huge impact on this family. They indicated they could not thank us enough. Now this is what ASR is all about. It’s not just about motorcycles or riding motorcycles. This is why I love my ASR family and this ministry. Saturday’s unity for outreach was just awesome. “Sunday was Biker Sunday. Kickstands up at 8:30. Well, with our group it was closer to 9. LOL. I looked on my radar and saw that it was raining up by the church, which was a 35-mile ride. I told everyone to put their rain gear on. Sis. Curley said, “Have faith.” I smiled and said, “You don’t live up here. You’re going to get wet. Rain gear on.” We headed north to the church. The only water we got was that which was already on the road from the prior rain that went through. Yes, Sis. Curley, there is power in prayer. Sunday’s service was so anointed Pastor Doug Joseph (ASR District Coordinator for West Virginia) preached, giving us an amazing word from God. 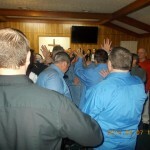 We had 3 people get water baptized in Jesus name, and one of them got filled with the Holy Ghost! Praise God. With all our hard work during outreach the prior day, we had 12 outreach dinner tickets come through the doors, of which two of those brought their entire family. So our count was about 20 that came as a result of God blessing our outreach effort. Praise God! After service was the pig roast and basket raffle. Delicious! The pork really hit the spot. As we were eating, one small cloud came through to dump some rain. However, once we all had eaten and the raffle was over, the sky got clear when it was time to ride. Sunday events are not over yet. Once we got back from our ride, everyone rested. Then we met up for dinner and some good ASR fellowship, one on one. Updated version of ASR’s iOS app is now available! Version 2.2 of the ASR iOS app is available now in the App Store! Note: If you had version 1.0 first, be aware that after updating to 2.2 you may need to restart your phone in order to use the updated app. 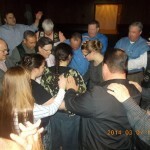 World Network of Prayer publishes report on ASR’s 2nd Bind The Strong Man event! 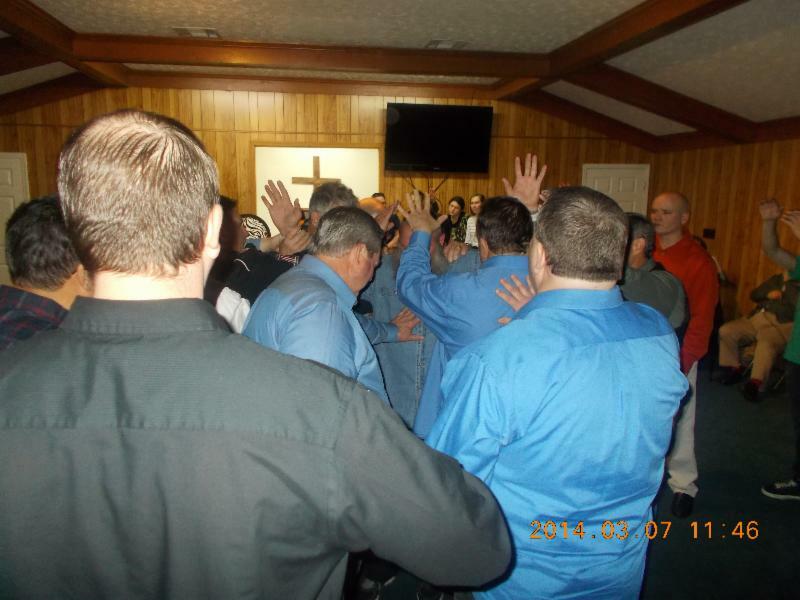 Last weekend, Azusa StreetRiders from seven states joined members of Turning Point Fellowship in Marbury, Alabama, Pastor Mike Markham, for Bind the Strong Man, an all-night prayer gathering. 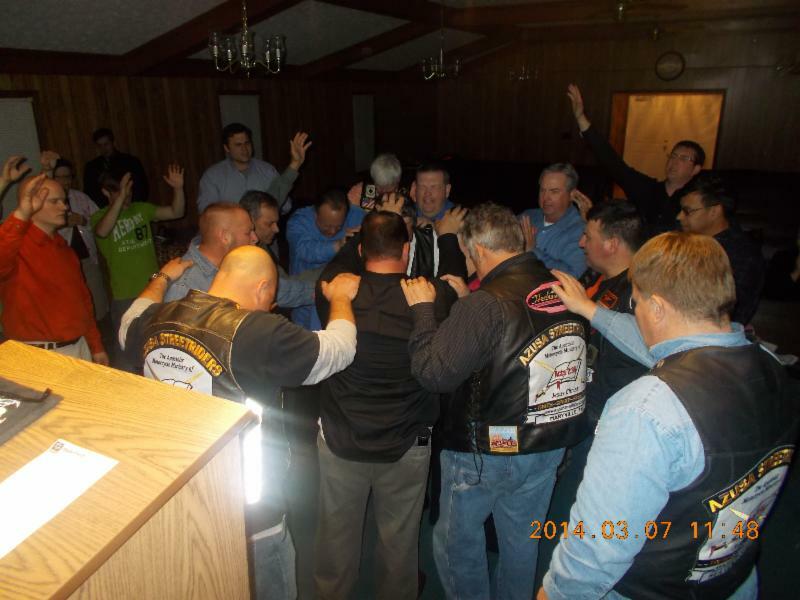 Additionally, several other churches in the US and Canada opened their doors for Azusa StreetRiders members, church members and guests to join in all-night, focused corporate prayer following the same hourly prayer outline as in Marbury. This was the second annual Bind the Strong Man event. At the event last year in Myrtle Beach, South Carolina, God healed Patrick Beall of brain cancer after doctors had given him little hope of survival. Other noted miracles took place. In Luke 24:49, Jesus instructed his disciples to “go to Jerusalem and tarry…” The world changed forever because these men obeyed Christ and traveled for a corporate prayer meeting. 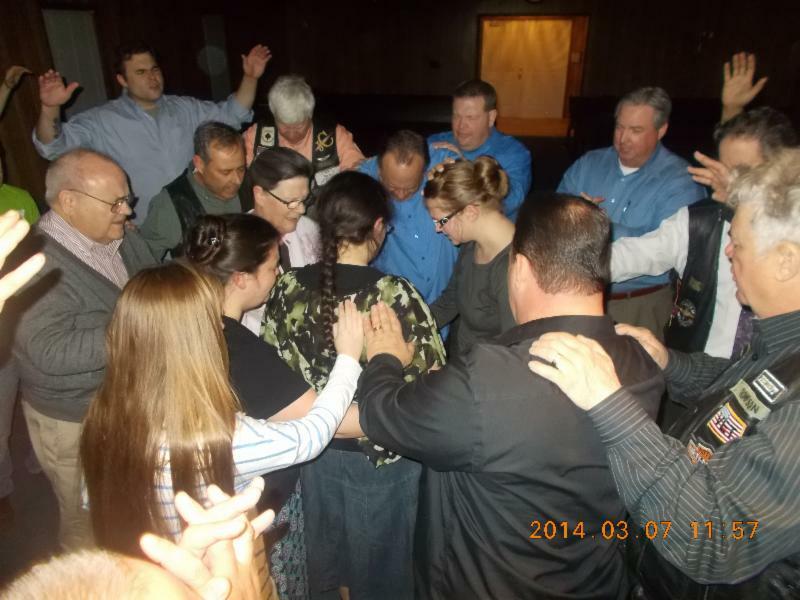 Please pray that more churches join us in our prayer efforts as we try to grow Bind the Strong Man prayer meetings with next year’s event to be held at Eminence, KY. 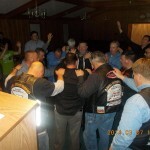 The Azusa StreetRiders Motorcycle Ministry is endorsed by the UPCI. Visit their website, azusastreetriders.com for more information on being involved in Bind the Strong Man prayer meetings. 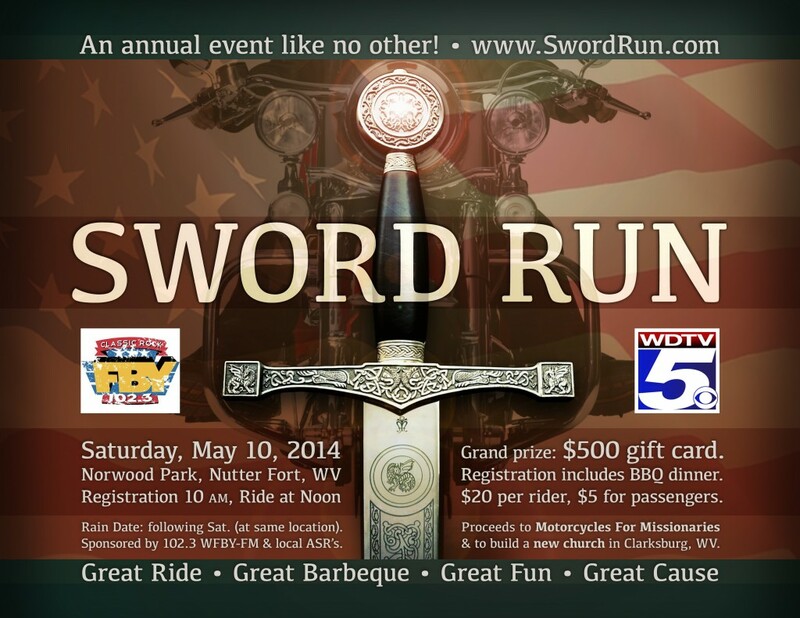 Event: 2nd Annual Sword Run in Clarksburg – Great BBQ, Great Ride, Great Cause! Start your riding season off with a great ride for a great cause! 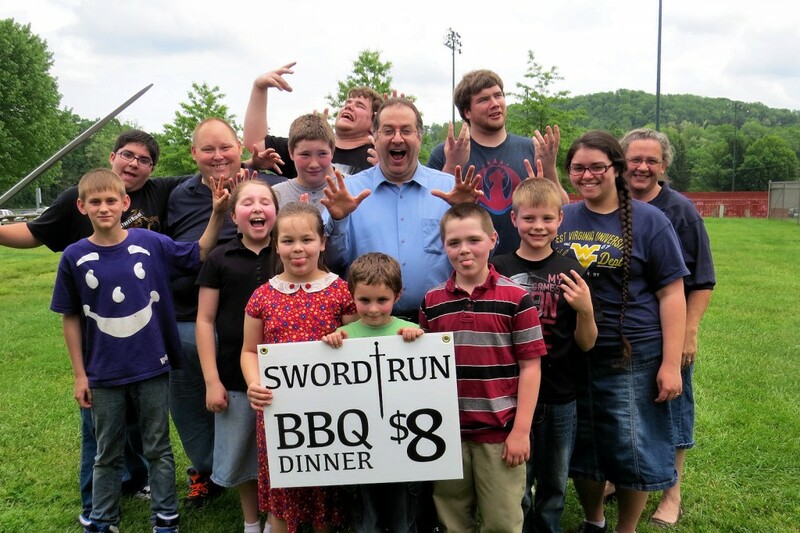 2nd Annual Sword Run in Clarksburg, WV, on Saturday, May 10, 2014 at Norwood Park in Nutterfort, WV (also known as Clarksburg City Park) [ Google Map]. Starting at 10 am, enjoy mouth-watering slow-smoked barbecue, door prizes, raffles, and a chance to win a $500 grand prize! NOTE: Hotel (Sutton Inn) is filling up fast. Book ASAP. Special rate is $78.57 including tax (upstairs rooms). Call or email either Pastor Doug Joseph or LaDonna Joseph to obtain one of the rooms we’re holding onto. Register online or get details at SwordRun.com. Proceeds go to “Motorcycles For Missionaries” and help to build a new church facility in the Clarksburg area. Event brought to you by 102.3 WFBY-FM, WDTV Channel 5, and the local Clarksburg chapter of the Azusa Street Riders. Are you interested in helping to sponsor this event? Then download the Sword-Run-Sponsorship-Form and/or visit SwordRun.com.